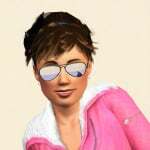 The pictures of your sim in her new home look great! 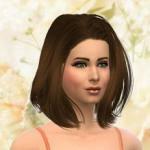 @60smusicluvr It was very nice seeing the sim whom the home was designed for. I love it! The adorable octopus, the tea party in the gazebo and just love the bathroom ceiling! Awesome! It's lovely, @soocoolsim! I love all the intricate detail you put in it. You've really nailed the Victorian look with your use of patterns and you really went the extra mile with the ceiling tiles and an extra million by making the octopus (!). Thank you so much! He looks adorable. Despite seemingly messing around with the home, his eyes say that he's totally innocent. He couldn't hurt a fly. The gold on the exterior gives it that little extra touch of steampunk, but what I really like about it is that the home could really fit anywhere, so I imagine it will get used fairly often. Besides that, love the fencing. It's very cute. I think my favorite room on the inside is the bathroom. Absolutely love the gold all over. It's so pretty. Appreciate you adding some things for sims to do that aren't "loud." It fits the Victorian era well, but still manages to tickle your fancy. 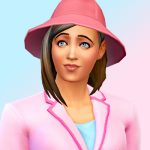 It's the perfect, quiet home for Victoria Prismall, my socially awkward, bookworm sim. Thanks again, soocoolsim. It is gorgeous. I'm so happy you're enjoying this house @60smusicluvr . It's always extra special to receive feedback after going in game. Thank you for sharing the pictures of Victoria. My goodness she fits in so well, doesn't she. I'm stumped by the disappearing and reappearing piece as well. I'll check that out in my game too and see if I can find a solution. Almost like if FadeObjects is on just for that section. So weird. 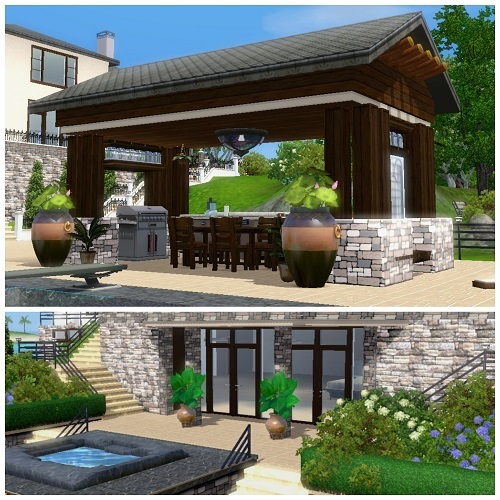 @soocoolsim , the house turned out awesome and love the choices you made in the end for the exterior, looks great! I love that bathroom and your ceilings and the gazebo looks so pretty. I wouldn't even know where to start to create that cute little octopus, very clever. Already got ya rec'd, but will DL to get a closer look at all your details. Well done! Octavian is a stunning build, dear @soocoolsim ! You always overcome yourself and impress us every time. I do love the name you chose too. @60smusicluvr , I placed the lot in another world I'm currently building in and couldn't replicate the fading piece. Is it still happening? Does the same thing happen if you place it in another lot? Your latest editions sweetie are breathtaking, to say the least! You are one amazing builder! Octavian is a very beautiful house! I've always admired your fantastical holiday builds but I had no idea you created such lovely stately homes too. It's been a treat looking through your studio over the weekend. 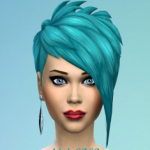 I am so happy there are still such talented creators playing Sims 3. The exterior design of Mercer Mansion looks very nice! Very nice layout of the build! The outdoors areas look very nice! Very nice plant beds! The pool and outdoors dining area is very nice! The water fountains going into the pool look great! Sims will enjoy relaxing in the hot tub. Very nice roof covered outdoors cooking and dining area! Sims will enjoy cooking meals on the BBQ and eating the food at the tables in the outdoors air. The large vases of flower plants look great there. The entrance area to the home looks very grand!. It is great that there is a 6 car garage! The different levels of patios look very nice. I am still amazed at the detail and skill you used to recreate this gorgeous Mansion! Truly a work of Art! 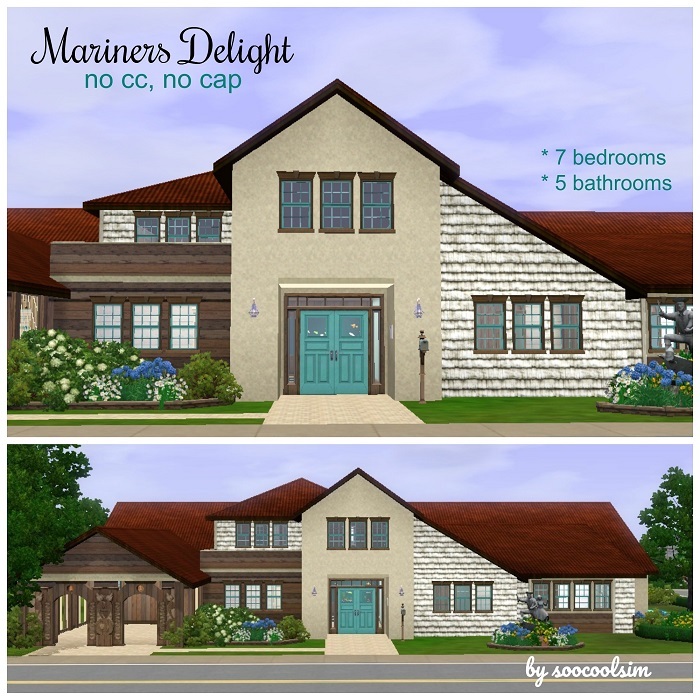 @soocoolsim, Mercer Mansion looks amazing! @soocoolsim Omg! It's gorgeous! Thank you so much for this incredible shell, I'll be sure to post some pictures of the interior on a thread as soon as I have time to sim! Mercer Mansion is one of the most beautiful houses you ever made, dear! I do love it! Mercer Mansion is such a palatial home, I'm sure it will be a joy to furnish for many simmers and their numerous offspring. It's very clever using the pagoda roof pieces on the outdoor pavilion. I love the sweeping feeling you were able to create with the sunken pool area. The front walk-up an garage area is so lovely. Symmetrical architecture really appeals to my sensibilities, but it usually comes at the cost of visual interest. I love how much interest you were still able to fit into the area, I'm impressed. Really great! @soocoolsim , I am always so impressed with your talent for CFE, terrain and landscape work. Mercer Mansion turned out beautiful, great job on a really difficult house to build. Sea meets land in this charming 7 bdrm, 5 bathrm home. A harmonic blend of nautical and rustic decor adds colour and warmth while repurposed wood add visual interest. Features include a large eat-in kitchen, nursery, double garage with wood cut detail, playground, study and attic space.